Marty Holah amassed 36 New Zealand caps before heading to Wales to play for the ambitious Ospreys. Holah, a combative and fractious openside flanker or a mobile No.8, was a loyal servant to both Waikato and the Chiefs during his time in New Zealand, coming to the attention of All Blacks selectors in 2001, making his debut against Samoa. Holah was used primarily as a replacement during his early years in the setup, before nailing a run of games at No.8 during the All Blacks' 2002 autumn tour of the northern hemisphere. Holah was selected for the 2003 World Cup, and made seven appearances during the tournament, scoring a try against France in the third-place play-off. Holah then made four appearances during the 2004 Tri-Nations. In 2005 Holah was instrumental in helping the New Zealand Maori to a famous win over the British and Irish Lions at Waikato Stadium, before taking to the field as a replacement for the All Blacks during the third Test at Eden Park. Holah was selected for the All Blacks in the unfamiliar position of blindside flanker against Ireland in 2006, in order to accommodate Richie McCaw and Rodney So'oialo. A poor performance - Holah was pulled just after half-time - signalled the end of his time in New Zealand. Holah signed for the Ospreys in 2007, helping the region to the EDF Energy Cup in his second season with a stunning performance against Leicester at Twickenham. In Decemeber 2008, Holah extended his stay with the region and he continued to excel, earning the Ospreys Coaches' Player of the Season award at the end of the 2009/2010 campaign. 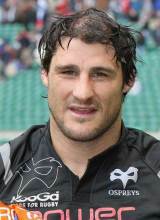 However, in April 2011 he announced that he would be leaving Wales, having re-signed with his native province Waikato.